Over recent months I've been feeling overwhelmed by the sheer amount of 'stuff' we have accumulated. So I have started making in-roads into decluttering the house. The resulting piles of things to sell were threatening to take over our basement. And, to be honest, listing individual items on eBay, Gumtree and Facebook selling groups was taking too much time and bringing few rewards. So I decided to take the bull by the horns and brave a car boot sale. The idea of setting the alarm for 5am on a Sunday morning was horrific. But, quite frankly, the idea of having piles of 'stuff' sitting downstairs any longer, was enough motivation to bypass my lie-in. Here are my tips to do a car boot sale like a boss. Tip one: Enlist some help. 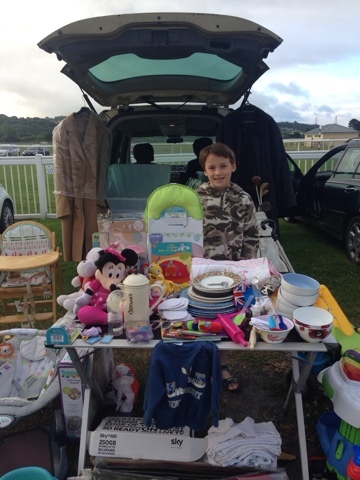 My eldest, who is nine years old, was keen to spend a morning helping me sell our unwanted clutter. However, he did name a price - I was to buy him a McDonalds breakfast on the way! You can imagine how disappointed he was when we arrived at the 24 hour drive thru and discovered it was closed for refurbishment. We then discovered that 24 hour Tesco is not open 24/7 and is, in fact, closed at 6:30am on a Sunday morning. Likewise, the Tesco Express is also closed until 7am. Luckily, I found a garage and gave him a sausage roll and a Galaxy milkshake and he seemed happy enough. Anyway, having help was essential as it meant I had a runner to go and buy me more coffee and I had someone to man the stall when I needed to go to the toilet. It also meant I had an extra pair of eyes and hands on the stall for busy periods. Tip two: Pack the car the night before. Given the early morning start, we opted to put load the car the night before. This was a good plan as it meant I had time to pack snacks and a drink and to make myself a large coffee to help me through the long day ahead. Tip three: Organise your boxes. We had a couple of boxes of stuff that were in the same category: clothes; kitchen stuff; and toys. But the rest was a bit of a mishmash. This made it more difficult for potential buyers to find what they might be looking for. Next time we go, I'll definitely work on packing more sensibly so it's easier to just whack out the boxes on and around the table rather than just chucking everything out and hoping for the best. We took our camping table to display our wares, and then placed a couple of boxes and some larger items around this. But I noticed that other sellers were able to really maximise the space on their pitch with a hanging rail for clothes, a sheet laid out next to the table for things like DVDs and books, as well as boxes for things like soft toys. If you make it easier for buyers to browse, they're more likely to spend some time at your stall and thus, more likely to buy what you are offering. Tip five: Take plenty of small change. Not only do you need to take money to pay for your pitch. You also need to be able to give customers the right change when they only have a five or ten pound note. This resulted in a late night raiding of all our piggy banks and a quick sweep behind the sofa cushions, but we managed to cobble together enough small change to ensure we didn't lose a sale due to not being able to provide change. Tip six: Make a note of your float. We had to remember how small change was in our float so we could reimburse the piggy banks, but it's also very helpful in working out how much money we actually made from the car boot sale. We paid £8 entry and we had £8 in our float and we came home with around £37, which meant our morning generated £20 - give or take the two coffees I needed to buy while I was there. Tip seven: Remember, you are in control. When you arrive and start setting up your stall, don't be afraid to tell the early bird buyers to wait until you are ready to sell. It can be a little disconcerting to have people asking about items you haven't yet unloaded from the car. But you don't have to sell anything until you are ready and it won't hurt them to wait until you have set up properly before they buy from you. Tip eight: Have a price in mind. You're likely to have an idea of what prices you are going to ask for your items. Be open to haggling, but don't be afraid to stick to your price if you feel your item is worth more that what someone is asking. Tip nine: Keep your eye on the prize. When you're looking at other people's stalls it can be tempting to eat into your profits by buying. But remember why you're there - for us, it was to declutter. Before you part with cash and diminish your profits, think about whether you need that item or whether it's just going to add to the clutter problem when you get home. One of the benefits of taking an assistant with me, apart from having someone to talk to, was that it meant we were able to have a quick look round at the other stalls. He went with some pocket money, although I am very pleased and relieved that he didn't buy anything to replace what we were selling. I looked round because I was interested in what other people were selling. I also had a good nose at what people had already bought when they passed our stall. 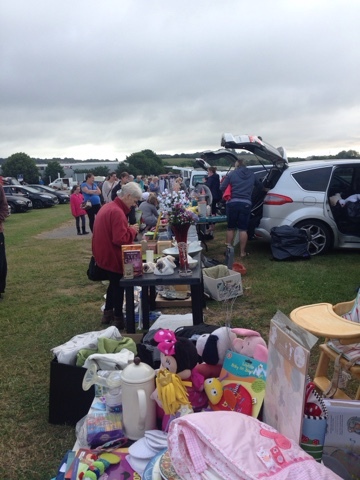 We enjoyed our car boot sale so much that we plan to go again in a couple of weeks. My son loved helping out and looking around the stalls and I've been really invigorated to get home and do some more decluttering. What are your top tips for a successful car boot sale? Good work! My two are very keen to attend a car-boot (as buyers) and I love a dig around too, but until we've moved I don't want to add anything else to the household clutter levels! It's actually quite a pleasant way of spending a Sunday morning. Thanks Karen. Great tip about the "pros" that's really useful to know. I might have to rethink my strategy for next time and make sure I get the more 'valuable' stuff out first so I'm prepared. Definitely sorting into boxes such as size (in the case of clothes) where you can just put them out straight away. I really didn't like the set-up where a man was actually unloading our boxes from the car to see if we had anything he wanted. I was so stunned that I didn't say anything to him!